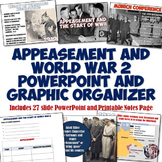 Appeasement and the Road to World War 2 - Activity Package - 20+ Pages/Slides! 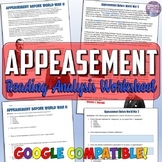 This great assignment allows students to examine three different cartoons while incorporating cartoon analysis skills that address CCSS RS #1 (citing specific evidence to support analysis). 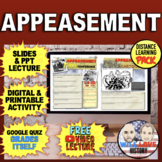 The end product is the creation of an appeasement or isolationism political cartoon. 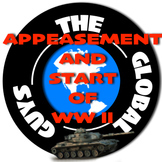 A concise two page reading defining appeasement and the steps to World War ll because of it. The reading covers Hitler's military build up through the invasion of Poland. 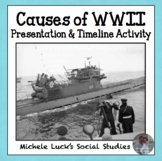 It also contains a timeline activity. Its perfect for a homework activity. 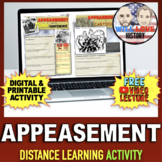 This handout was created to show the students how appeasing Hitler by relaxing the Treaty of Versailles enabled him to keep mounting pressure on Eastern Europe and lead to his invasion of Poland and other countries. 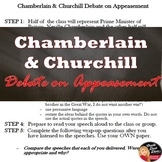 This is a packet that analyzes the policy of appeasement with descriptions, analysis, pros and cons, and selected quotes from Churchill and Chamberlain. It will culminate in a speech activity for students to choose a side and write a speech defending their position.